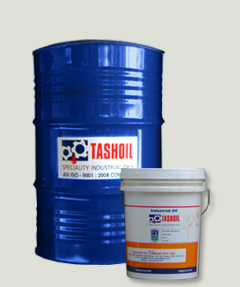 Hydraulic Oils (EP Series) :: Tashoil Company Pvt. Ltd. These mineral oil based HYDRAULIC FLUIDS which carries high grade additive for Antiwear. Different grade indicates its viscosity at 40°C. As the name implies, they are especially treated to do an outstanding job of protecting parts against rust and to minimize Oil Oxidation. All grades are manufactured from selected quality petroleum base stocks which are generally used for high priced Turbine Oils, which results heavy loads sustaining over longer periods. Antiwear, Anti Oxidents, Anti Corrosive, Defoamer, Formulated long Chain Polymers to improve Viscosity Index for the application where a wide range of temperatures are encountered. Because of their Superior antiwear property “HYDRASH - EP” Oils help to extend life significally in Vanes, gear and piston type hydraulic pumps. In a typical VICKERS PUMP test, in which HYDRASH –EP 46 was used as the medium, the test parts lost less than 0.001% of their weight after a 1,000 hour run at 175°F and under pressure of 1,000 PSI A FALEX WEAR TEST with HYDRASH-EP 46 ended with1/25 of the amount of wear that developed when comparable Oils were tested. Can be effectively used for Boring lubricated by “Continuous use method” Electric Motors and generators Spindles Gear Boxes not requiring on EP type gear Oil.